This week, to go along with Election Day, we have a special video below called #MyFirstTime where celebs such as the Suffragette filmmakers and star Carey Mulligan, Kathy Baker (The Age Of Adaline, Edward Scissorhands), Trieste Kelly Dunn (“The Good Wife,” “Banshee”), Rosanna Scotto (WNYW Anchor), and more recall the first time they ever voted. In addition to the #MyFirstTime video, we have a new featurette clip, "19 Days Of Suffrage" Day 1-5 badges for this week, and have also attached interesting facts about women’s firsts in politics to think about as we exercise our right to vote TODAY!!! New Featurette Clip – “Now &Then"
Week of 11/23: Things to Be Thankful For; Thanksgiving (11/26); #fightsnotover, there are still many women around the globe who do not have equal rights, what rights are you most thankful for? …and that she is not alone, as brave women from all walks of life have joined the fight for equality. Pharmacist Edith Ellyn (Helena Bonham Carter) and upper-class Alice Haughton (Romola Garai) coordinate WSPU grassroots efforts. Maud’s commitment to the movement is tested by giving testimony before Parliament, a brutal street skirmish – and a jail stint that, while brief, alarms her husband. But her resolve is strengthened by observing Emily Wilding Davison’s (Natalie Press) ability to endure prison stints – and by meeting WSPU founder Emmeline Pankhurst (Meryl Streep), who emerges from hiding with an electrifying public speech that galvanizes the Suffragettes to activism. Maud’s dedication leads her to hard choices that will change her own life forever, as she strives to effect real change for generations to come. 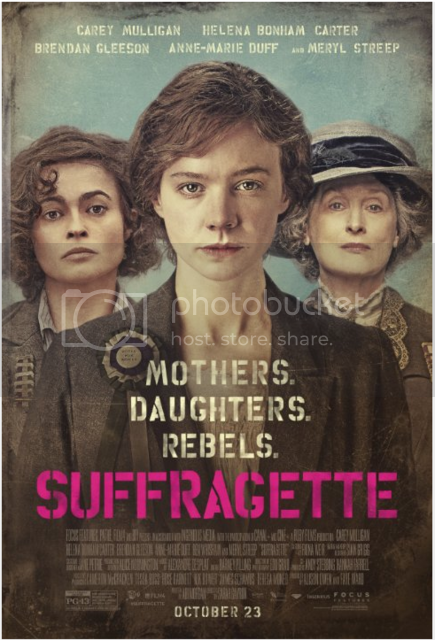 The police step up their surveillance and harsh treatment, with Inspector Steed (Brendan Gleeson) shadowing Maud’s journey at every step; ultimately, she and her fellow Suffragettes will risk their very lives to ensure that women’s rights be recognized and respected. A Focus Features, Pathé, Film4, and BFI presentation in association with Ingenious Media with the participation of Canal+ and Ciné+. A Ruby Films production. Carey Mulligan, Helena Bonham Carter, Brendan Gleeson, Anne-Marie Duff, Ben Whishaw, and Meryl Streep. Suffragette. Casting, Fiona Weir. Hair & Make-up Designer, Sian Grigg. Costume Designer, Jane Petrie. Production Designer, Alice Normington. Music by Alexandre Desplat. Editor, Barney Pilling. Director of Photography, Edu Grau. Co-Producers, Andy Stebbing, Hannah Farrell. Executive Producers, Cameron McCracken, Tessa Ross, Rose Garnett, Nik Bower, James Schamus, Teresa Moneo. Produced by Alison Owen and Faye Ward. Written by Abi Morgan. Directed by Sarah Gavron. A Focus Features Release. By 1900 women had been campaigning for the right to vote in parliamentary elections for over half a century. Fifty years of peaceful protest had, however, failed to arouse enough interest in the Suffrage movement to provoke reform and women, along with prisoners, the insane and the poorest men continued to be excluded from the parliamentary process. In 1903 the “votes for women” campaign was energised by the creation of the Women’s Social and Political Union. Founded in Manchester by Emmeline Pankhurst and her daughters the WSPU aimed to “wake up the nation” to the cause of Women’s Suffrage through “Deeds not Words.” The decision to relocate the headquarters of the WSPU to London in 1906 transformed the Suffrage movement and, for the next eight years, the fight to win the vote became a highly public and, at times, violent struggle played out against the backdrop of Edwardian London. The WSPU burst onto the streets of London at a time when women played little part in public life, their role in society being firmly centred on the home and family life. The Pankhursts stimulated in their supporters a ‘spirit of revolt’ that directly challenged this male dominated society by bringing women to the forefront of public life. By taking their campaign to the streets the Suffragettes attracted maximum publicity for their cause. Identifiable by their purple white and green colour scheme they became a familiar sight in central London. Street processions were announced by brass bands playing Suffragette marching songs and meetings and events were publicised by poster parades and pavement chalking parties. The move to the political heart of the nation enabled the Suffragettes to maintain a constant presence in Whitehall, petitioning Downing Street, heckling MPs and chaining themselves to government buildings. The Coronation of George V three years later inspired the WSPU to organise its own spectacular coronation pageant in an attempt to engage the support of the new King. The four-mile Suffragette Coronation Procession through central London culminated in a rally at the Royal Albert Hall and involved over 60,000 delegates from both regional and international suffrage groups dressed in national and historical costume. The Suffragette campaign was masterminded from WSPU headquarters, initially established at 4 Clement’s Inn, The Strand and, from 1912, at Lincoln’s Inn, Kingsway. Both salaried and volunteer office staff organised fund-raising events, public meetings and demonstrations and produced the weekly newspaper Votes for Women which, by 1909, had a circulation of 22,000. The WSPU established ninety branches throughout the UK but London remained the chief area of support with a total of thirty-four local offices. Branch members held regular meetings, organised fund raising events and supported the work of the national headquarters by participating in demonstrations and processions. In 1910 the publishing arm of the Union, The Woman’s Press, moved to 156 Charing Cross Road. The premises were chosen for their proximity to Oxford Street and included a shop selling a range of Suffragette merchandise including badges, books, postcards and stationery. The commercial success of the business led to the opening of nineteen similar shops in the London area from Chelsea and Kensington in the west to Streatham and Wandsworth in the south, Mile End and Limehouse in the east and Hampstead and Kilburn in the north. Over one thousand Suffragettes, including Emmeline Pankhurst and her daughters Christabel, Sylvia, and Adela received prison sentences for their militancy. Many were sent to Holloway jail in north London where they protested against prison conditions by enduring hunger strike and force-feeding. From 1912 the WSPU shifted the focus of their campaign to attacks on property and the disruption of London’s public life. An organised window-smashing campaign by 150 Suffragettes in May 1912 devastated London’s shopping district and caused Emmeline Pankhurst to remark that the hourlong protest “will long be remembered in London.” Suffragette attacks on works of art, including the slashing of the Rokeby Venus at the National Gallery, resulted in the closure of many London art galleries and museums to female visitors. Militancy often provoked confrontation with the police and members of the public resulting in undignified street fights and scuffles. For many opposed to the campaign Suffragette militancy was regarded as a threat to the balanced social and sexual order where men and women inhabited separate spheres. Suffragettes were often condemned as shrieking, hysterical females responsible for actually physically distorting the face and shape of the ideal, pure and feminine woman as mother. Captured in the national press being arrested, shouting, chaining themselves to railings and delivering political, rousing speeches in public they were also satirised in popular culture as ugly harridans wearing masculine clothing. The outbreak of the First World War brought an immediate suspension of militant action as the Suffragettes threw themselves into supporting the war effort. By taking their fight to the streets and making London the focus of their campaign, the Pankhursts had invigorated the Suffrage movement and inspired, in their supporters, a confidence and independence that enabled them to challenge the male dominated society in which they lived. Their work eased the way for women to take a more active and public role in society during the war. Their contribution to the war effort proved women were vital not only to victory but also to the long term economic success of the country – this value acknowledged with the granting of the parliamentary vote to propertied women over the age of thirty in 1918.